An affordable floor pump with features youd expect find on more expensive pumps. Double-sided TwinHead fits all valve types and its heavy duty construction will provide years of service. Enjoy huge pumping power, quality and durability at a more affordable price. One piece super-light folding tool. 18 tools fold into a forged alloy, anodized body. Carry Bag included. The Topeak JoeBlow Sport II has set the standard for affordable performance. Outstanding pump at a great price. Its like bringing your floor pump on the trail. High volume barrel fills fat tires fast while fold out foot pad and flexible hose make inflation a snap. 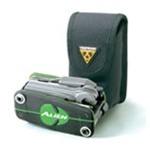 The award-winning ALiEN II is a clever break-apart design makes it easy to find and use the right tool. And with 26 high quality tools at your fingertips, youll rarely find yourself without exactly what you need. Theres even a bottle opener for post-ride celebrations! Comes with carrying bag. The Topeak Alien 3 features 25 different tools in one small package. Why even bother with a tool box when you can just have one tool?